Tyler Perry's A Madea Family Funeral Review: Fans deserve so much better – AiPT! I don’t hate the Madea films. Tyler Perry has said that he is going to retire the Madea franchise with this film. I had hopes that he’d wanna go out with a bang and deliver a top notch final Madea film for the fans. I was wrong, very wrong. Now I don’t hate the Madea films, I really enjoyed Boo! A Madea Halloween, however Boo 2! was a complete and utter failure, it didn’t even seem like anyone tried with that film. After Boo 2, I was nervous that Tyler Perry would give us more of the same here, and while this film is better than the previous one, it’s not by much. The same central characters are still at the center of the story: Madea, Joe, Bam, Hattie, and Bryan. This group of characters are good together for comedy, as was shown in Boo, and they are good here too. The reason they aren’t able to reach their full comedic potential is because of the material they’re given. There are many jokes that fall completely flat and then they just keep on going hoping something will land and it doesn’t. So while they’re floundering around trying to get this to work, the audience is forced to sit through the awkwardness. The jokes that are funny and do work are over with quickly and are pretty scarce. I kept hoping the material was gonna get better, that maybe that particular scene just didn’t work and after we got past it, it’d be good. But then the next scene was the exact same and it became clear that very little effort was put into this. Anyone who’s seen a Madea film knows that it’s not just the over the top comedy, there’s also some family problem to deal with. The majority of this part doesn’t work that well either. Weak writing and bad acting are both to blame for that. The “drama” is so forced and fake, and the actors that are apart of this family may be extremely attractive but they need to go back to acting school. The men are all 10 out of 10s as far as looks go, but their performances are cringeworthy. The women are beautiful, but their acting isn’t that great either. Their characters are extremely thin and stereotypical too, the bad guys are full on caricature and the good guys are doe eyed innocents. It’s all so lame and it’s very hard to care about. The only character that seems to work is the mother. She has a monologue towards the end that reveals some of why she’s behaving the way she is and her delivery works. I liked her portrayal of the character and wished the rest of the cast could match her. As far as the actual filmmaking goes, Perry is still having the exact same problems. I’d think that someone who’s been doing this for as long as he has would understand basics, for example, someone’s hair or shoulder shouldn’t be in the shot when we’re focusing on another character. It’s very distracting to have things like that in the shot and I just wonder why he feels that’s the best choice. It comes off as lazy, just like the writing and most of the acting. One improvement upon the last film that I was happy to see, and that’s the lack of dubbing and PG rated language. In Boo 2, the characters would clearly be saying either f**k or s**t but then something like “mess” would come out of their mouths and it sucked the comedy out. Here, they just went for it, which was refreshing. Tyler Perry’s A Madea Family Funeral is unfortunately a bust. The film needed to be directed by someone other than Perry, because he’s just not that great of a director, and it needed a much stronger script. And it’s all fine and dandy to hire attractive supporting actors, but make sure they actually know how to act first, otherwise they’re just models. 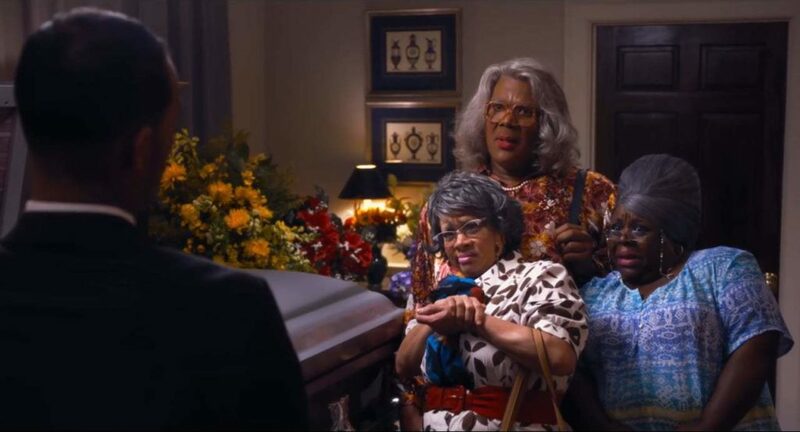 Tyler Perry's A Madea Family Funeral misses more than it hits, and leaves you wishing more effort given.